The use of modern laser systems has revolutionized therapeutic measures in the fields of Dermatology and Aesthetic Medicine. The corresponding treatment methods enable an effective therapy which is very gentle on the skin giving the best possible results for skin alterations of all types. In the hands of an experienced laser therapist the spectrum of possible therapies is very broadly based. In comparison to surgical procedures of the past, modern laser therapy promises quick, precise and, as a rule, scar free removal of skin alterations. Treatments take place as outpatient appointments and can usually be carried out WITHOUT anesthetization or a simple, local anesthesia. Patients no longer need to worry about possible anesthesia risks, protracted healing processes and lengthy downtimes. Even at-risk patients, who are unable to endure an operation for health reasons, profit from new laser procedures. The word LASER stands for “Light Amplification by Stimulated Emission of Radiation”. Here, an intensified and high-energy beam of light at a particular wavelength creates an effect as it transforms energy (light) into thermal energy (warmth). A laser works selectively, meaning it only amplifies the light of a precisely defined wavelength. Due to its specific wavelength, this bundled light energy only penetrates into the tissue structure being treated, WITHOUT damaging the surrounding skin. This special characteristic of the various laser procedures enables the precise, effective and gentle removal of all types of skin alterations. 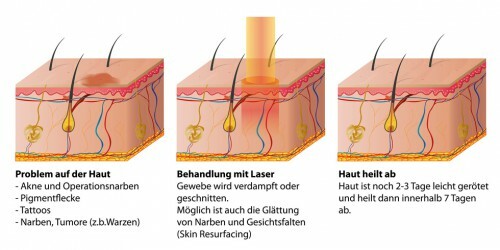 The different methods of laser treatment employed depend on the type and extent of the skin alterations. With the help of these laser systems, unwelcome skin alterations, such as warts, birthmarks, pigment abnormalities, alterations to the veins such as spider veins, couperose skin and port-wine stains, tattoos and permanent make-up can be removed. Laser therapy is one of the essential components of our daily work at the Dr. Hilton & Partner private practice. In addition to many years of experience and comprehensive know-how, our renowned specialists have the most modern equipment in the field of laser therapy at their disposal. Which lasers do we use? Cuts, abrasions, extreme inflammation, accidents, burns and even operations can often leave scars. Usually, a scar is noticeable as a light contour in the skin after the wound healing process. But sometimes the skin doesn’t heal completely. For example, after some operations, or cases of acne, red and bulging scars (this is how hypertrophic and atrophic scars and keloids are described) can occur. Keloids can arise as a result of a genetic predisposition or a somewhat impaired healing process; usually the shoulder area and décolleté are affected. Even when acne is treated successfully, the scars, both physical and mental, remain. Whatever the origin of the scars – they are disturbing to the aesthetic whole and effect one’s well-being to a considerable extent. There are a number of therapeutic options available now which enable the effective correction of scars. The specific method of treatment chosen always depends on the condition of the scar in question. If the scar is sunken in, for example, a filler such as Hyaluron can be used as padding. If it is a more proliferative scar, cryotherapy and corticoid injections promise a definite improvement. Laser therapy, on the other hand, lightens up broad and even red scars effectively and the scar can be narrowed and reduced in size by implementing this method of treatment. Laser peelings along with microneedling – particularly in cases of acne scars – also constitute a promising therapeutic alternative. The various methods of treatment ensure a significantly improved complexion. A scar cannot be completely removed by the therapeutic solutions currently available, however, after very good correction, the scars lose their optical menace and horror.